Healthy soil provides important stormwater management functions including efficient water infiltration and storage, adsorption of excess nutrients, filtration of sediments, biological decomposition of pollutants, and moderation of peak stream flows and temperatures. In addition, healthy soils support vigorous plant and tree growth that intercepts rainfall, returning much of it to the atmosphere through evaporation and transpiration and supports urban tree canopy cover. The health of the soil, vegetation and the receiving waters (e.g. rivers, lakes and wetlands) they drain to are intrinsically related and these relationships must be recognized in land development planning and urban construction processes in order to produce functional landscaped areas. Urban development alters the ways by which water flows through the local environment (i.e., the hydrologic cycle) as a result of clearing vegetation and topsoil, compacting subsoils during construction and creating impervious surfaces (e.g., pavement and buildings) and enhanced drainage systems (e.g., ditches, gutters, catchbasins, storm sewers). One approach to reducing the impacts of urbanization on the hydrologic cycle is to implement soil management best practices during construction that help maintain the capacity of landscaped areas to absorb rain and snowfall and prevent runoff directed to them from adjacent impervious surfaces from leaving the site where it is generated. The lawns, gardens, sports fields, parks and open space components of our urban environments all contribute to how absorbent our urban landscapes are to rain and snowfall. They also contribute to making our cities, towns and villages, beautiful and healthy places to live. Application of improved soil management practices during urban construction can reduce stormwater runoff and outdoor water use, produce more lush yards and landscaped areas that are easier and cheaper to maintain, and provide the growing environment needed by urban trees to reach maturity. 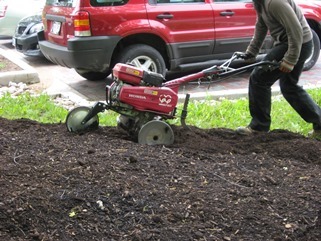 • Restoring post-construction soils in areas to be landscaped to meet minimum soil quality and depth standards.